Since I started working on GOOD FOOD FOR GOOD, time and again I received advice from well wishers that I have chosen not to follow. It was always given with good intentions and to make GOOD FOOD FOR GOOD more profitable. I decided not to follow them because they would make me deviate from my mission. I started GOOD FOOD FOR GOOD to make a positive difference in two of the world’s solvable problems – Bad Food and No Food. Making business profitable is important but not if it deviates from my mission, I am building a business that is based on GOOD – what I call good. From the day I started this business I have received this advice from food scientists, traditional food businesses and even some co-packers.They are coming from a good place as having a shelf-stable sauce will be great for expansion and economies of scale. However, it defeats the purpose of Good Food for me. I don’t consider food that was cooked years ago and preserved by adding preservatives (even food grade and organic preservatives) as fresh. If it is not GOOD FOOD in my eyes, I wouldn’t be able to stand behind it. Besides, world dominance is not my goal! So making food that would last another World War is not what I am going for here. To be clear, I am not against the art of preserving, I think foods that are naturally acidic (pickles, jams etc) that do not require manipulation or scientist involvement to preserve for life are a great way to enjoy fruits and vegetables when they are not in season. Even though making fresh sauces is more challenging logistically and is much more expensive for me to store and hinders my ability to grow fast, I still prefer to keep it this way! I believe food is our fuel and we need to take care of what we put in our bodies. After all, garbage in – garbage out! I am happy making a positive difference in fewer plates than in no plates at all! It makes my day when patrons try the sauces and tell me how fresh they taste! I was also advisced not to use fresh ingredients in my sauces as that creates complications with regards to consistency and logistics. Unfortunately food has become so industrial that we expect even all tomatoes to look the same. I know using fresh produce poses some challenges in terms of availability and consistency of the final product and using already processed tomatoes, onions and garlic might help minimize the risk. However, I am a real food believer and I didn’t think cooking from ingredients that have already been processed in a plant justify as real food to me. Besides our grandmothers and great-grandmothers never cooked with canned tomatoes to maintain consistency and their food always tasted good. I know its complicated and my food from one week might look and taste slightly different from the weeks before but I don’t think there is anything wrong with that as long as it still tastes good. Luckily GOOD FOOD FOR GOOD patrons appreciate this and value the food for its freshness and uniqueness. Besides all canned tomatoes are skinned and loose most of their Lycopene, by using fresh whole tomatoes with skin and seeds GOOD FOOD FOR GOOD ensures that the sauces have a rich amount of nutrient. “Food is thy medicine” after all! Only If I had put a penny for every time I heard this! 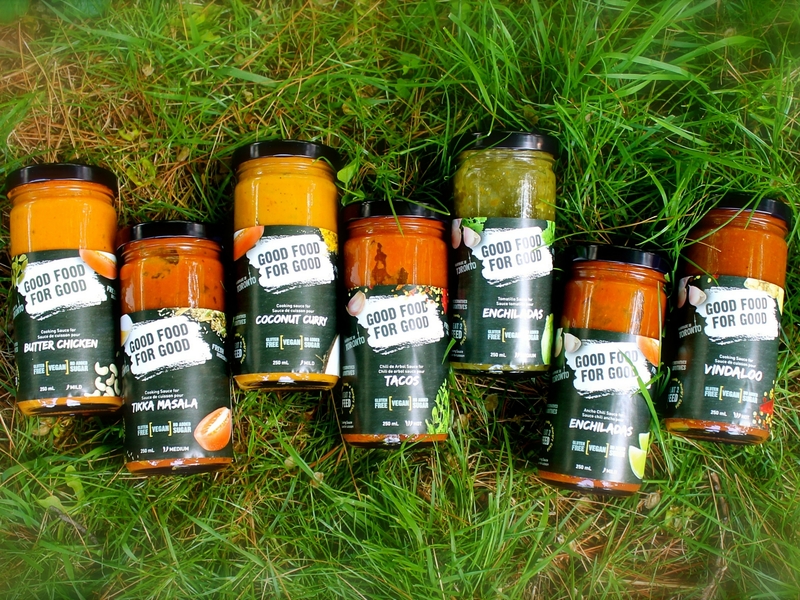 To me Good Food For Good is all about fighting two big food issues – scarcity of real food for people who can afford and unavailability of food for about 1/6th of the worlds population. Good Food for Good would not exist if I am not impacting both at the same time. I feel proud that I have made a positive difference in more than 14000 meals combined (Toronto & India) even before we made a single penny in profit. That is like making a difference in 20 meals every day since the inception of Good Food for Good. This is what drives me to wake up and do what I do everyday! I truly believe businesses exist to make a positive change and profit is just a reward for making a positive difference. I would not change that for anything. Starting a business is risky and I am glad I have met amazing people along the way to guide me to make this venture a success but I wouldn’t have been able to call it a success if it had to make me compromise my values.